There's Nancy looking down from one of the Balcony staterooms that overlooks "Central Park". Notice the sun in this pic? It's open sky above, how cool is that! 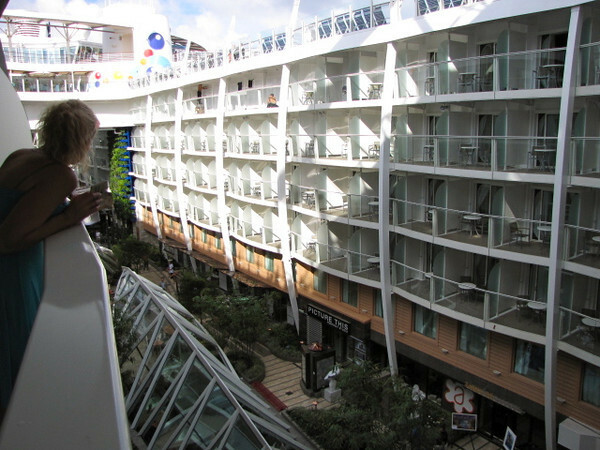 **Note** Although a fun & unique type of Balcony for a Cruise Ship, we don't recommend Oasis' or Allure's "Central Park" or "Boardwalk" Balconies as they can get noisy with people right underneath... stick with an Oceanview Balcony!